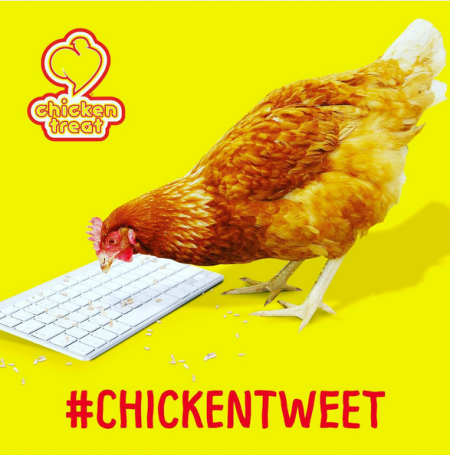 Betty the Tweeting Chicken, @chickentreat seen here in her “training video” brings new meaning to the term “chicken scratch”. She’s vying for a Guinness Record is she can Tweet a 5-letter word before Oct. 30. She’s not the first chicken to go viral. That honor went to the Subservient Chicken back in 2004. I love it when a brand has a sense of humor! The magic of Australia’s Chicken Treat Restaurant chain’s classic roasted bird is in its simplicity and the magic of its branding and local marketing campaigns is its light-hearted approach. Of course, Betty’s not the first chicken to promote a brand. That honor belongs to Burger King’s deliciously weird 2004 Subservient Chicken, one of the internet’s first viral sensations. 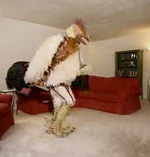 He was a man dressed in a giant chicken suit complete with a garter belt (??!) – who’d do anything you asked him, as long as it wasn’t x-rated. Back in the days before social media, he racked up a million hits in the first 24 hours, eventually reaching more than one em>billion pageviews. Burger King brought him back, sort of, on the campaign’s 10th anniversary. But, alas, he didn’t fly. Wishing you luck Ms. Betty!